This recipe substitutes couscous for bulgur wheat, so is not at all traditional. Since the couscous are so much easier to prepare, this version is much easier for the busy cook lacking kitchen help. Whisk together the oil and juice, and dump with water over couscous (should have about the same volume of liquid as couscous) and salt in serving dish that is at least three times the volume of the couscous. Set aside for 5-10 minutes for the couscous to absorb the liquids. Cover if you think of it. Meanwhile, prepare veggies by finely chopping. Quantities and selection are up to you. 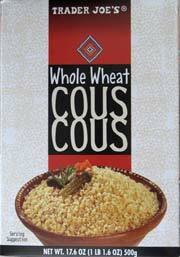 Volume can range from about 1/2 the volume of the couscous to two or three times as much. Fluff couscous with a fork, then gently mix in the chopped veggies. Add salt and pepper to taste. Set in fridge about 15 minutes to cool, then serve.